Peek-a-boo isn't a baby's favorite game by chance: after their first birthday, babies begin to understand that even when something isn't in sight, it still exists. They anticipate that it will reappear--and when it does, they laugh in delight. This charming lift-the-flap book with see-through die cuts encourages little ones to play the game. 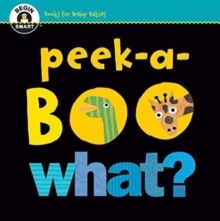 With its simple rhyming text and pictures of familiar objects and animals, Peek-a-Boo What? helps solidify object permanence.